At Cape Breton Highlands golf course, you have the opportunity to explore a truly unique golf experience. Built during the last years of The Great Depression, as a federal ‘make work’ project, it opened in 1941. But it wasn’t just any golf course. Parks Canada had employed Canada’s greatest Golf Course Architect; Stanley Thompson, and given him a canvas like no other. Thompson is best known for his work on Canadian Railroad hotel courses, like Banff, Jasper, or St. Georges, but most golf historians agree that the Cape Breton Highlands course was the best of his best. Even the walks and vistas, will take your breath away. 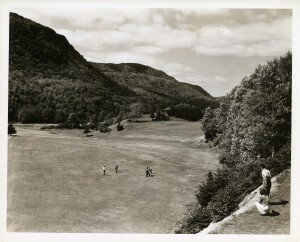 While time, economics, and well-intentioned subsequent Golf Course Architects; have meddled with many of the 100+ courses that Stanley Thompson designed, Cape Breton Highlands, is nearly exactly as the master Architect left it in the 1940’s. In many ways, it may not look like the modern courses that most of us are accustomed to playing. The maintenance practices at Cape Breton Highlands, are as close to the style of mid-20th century maintenance as are practical. Our bunkers are hazards, and not the pristine pseudo-hazards of the 21st century. Fairways are not level, and challenging lies are the norm. You won’t see close-mown bent-grass tees. The greens are firm and true, and you’re unlikely to see a straight putt in 18 holes. What can we say about the quality of the layout itself? It’s Stanley Thompson at his best, consistently ranked among the top 10 courses in the country, and frequently enters the discussion of the best in the world. We accept that not all golfers are up to the challenge, or will embrace this ‘once on the planet’ experience. But for those who want to tread on golf history, we’ve placed snippets of our past throughout the property on placards and signage, to help you to immerse yourself in the same vision that Stanley Thompson saw over 75 years ago. Let yourself go, and allow yourself to have a round with the ghosts of Cape Breton Highlands’ storied past. You just can’t get this any place else on earth.